Advancing transformational change. Facilitating emergent solutions. Hosting conversations that matter. The tragic oil spill in the Gulf of Mexico offers a vivid illustration of how we must be the master of both clockware and swarmware. “Clockware” is a term that describes working in ways that are rational, planned, standardized, repeatable, controlled and measured. In contrast, “swarmware” refers to working in ways that explore new possibilities through experimentation, trials, autonomy, freedom, intuition and working at the edge of knowledge and experience. The idea is to say just enough to paint a picture or describe the absolute boundaries, and then get the people in situations with high levels of complexity active in trying whatever they think might work. When drilling and operating a well with over a mile of water between the platform and the well head at the bottom, things need to be thoroughly thought out, precisely planned, operated within extremely tight tolerances, and with the highest levels of vigilance. Apparently that did not happened. A cascading series of small lapses—each by itself perhaps not so bad—led to a catastrophic failure. And the failure occurred in ways for which there were no quick solutions. Now we are facing a gusher of oil and gas that can’t be staunched and is threatening ecosystem and livelihood along vast areas in the Gulf and along the coast. As we saw after hurricane Katrina, when there is widespread disaster encompassing a complex array of problems, clockware approaches lead to dismal failure. The top down, command-and-control approaches move too slowly and are not effective in mobilizing the needed scope of the response. They also do not promote the innovation and application of creative and novel responses necessary in the huge number of unique situations. What is called for is a swarmware approach. Everybody needs to be trying everything that could possibly work. On the ground experimentation will demonstrate what is effective in various situations. The people closest to the situations need to be empowered, mobilized and given the resources and support they need to find and execute what works on the ground. The command and control folks will find all kinds of reasons to not do it that way. But when the problems are as messy as the ones in the Gulf, it takes messy strategies and messy solutions to mount an effective response. In the past few weeks, a critically important idea has come up over and over again in my conversations with people who are leading in environments of rapid change, uncertainty or disagreement. These conversation all start with affirmation of a compelling vision, and the commitment of time and energy that it takes to bring that vision to life. Pretty soon we get to the part about how difficult and tiring it is trying to control all of the pieces of the effort. Eventually get to the challenges of building a structure, organization or container that would allow for control of all those pieces. The people holding these wonderful visions are often frustrated, or tired, or highly stressed. Some question whether they will be able to move the effort far enough to realize the vision. I point out that creativity and new possibility don’t happen in the circles of order or control. Life may seem so much more manageable when our work is orderly and some of may yearn for control, but very little innovation can take place there. At the other end is chaos and the extreme of apathy and despair (chamos). In chaos, a lot may be happening but very little may be getting done. What does get done takes more effort and and leaves more bruised egos and hurt feelings. In chamos, everyone pretty much gives up. Nothing new and exciting happens at the two extremes. People are incapable of acting out of apathy and despair. People are strongly discouraged from innovating when control is exerted too strongly. 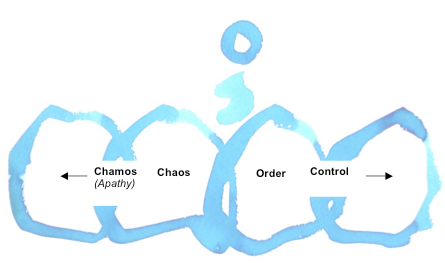 To realize our visions for better organizations, better communities and a better world, it will take us choosing to work on the edge between order and chaos. My next posting will discuss what it is like to work on the edge. Today is the 100th anniversary of the death of Mark Twain (Samuel Langhorne Clemens). He was an author, lecturer, humorist, philosopher, social commentator, and cat lover. Here are some pearls of his wisdom that strike me as having lasting relevance. A statesman gains little by the arbitrary exercise of ironclad authority upon all occasions that offer, for this wounds the just pride of his subordinates, and thus tends to undermine his strength. A little concession, now and then, where it can do no harm is the wiser policy. Courage is resistance to fear, mastery of fear - not absence of fear. Except a creature be part coward it is not a compliment to say it is brave. These are unprecedented times. It has simply never been this way before. Our world had never been more interconnected and interdependent. To be successful, leaders need to deal with high levels of complexity and situations loaded with abstraction, diversity, ambiguity and paradox. Our familiar mental models do not equip us for this. Our mental models are based on short-term, straight-line ideas of cause and effect. involve the people concerned in developing the solutions. But we know that getting to the place where we can abandon our familiar mental models can be a long and difficult struggle. And some folks will never get there. So for the folks who would prefer to stick with the familiar straight-line models to deal with increasingly complex situations, here’s some time-tested advice on how to ride a dead horse. Buying a bigger, stronger whip. If you have other strategies for riding dead horses, please post as comments. Or if you are convinced that you can still get some mileage from a dead horse, tell us how that is working for you. For every complex problem there is always an answer that is clear, simple, and wrong. There’s my favorite H. L. Mencken quote again. The truth of those few words keeps coming up over and over again in my life. Those who believe that there is a clear, simple solution for every complex problem and confidently drive their organizations based on belief in themselves and those solutions. Those that understand that complex problems do not have clear, simple solutions and are much more humble in the way they lead. She believes we only progress through a series of regulated errors. Every move is a partial failure, to be corrected by the next one. Even walking involves shifting your weight off-balance and then compensating with the next step. She knows the world is too complex and irregular to be known, so life is about navigating uncertainty. She understands she is too quick to grasp at pseudo-objective models and confident projections that give the illusion of control. She has to remember George Eliot’s image — that life is like playing chess with chessmen who each have thoughts and feelings and motives of their own. It is complex beyond reckoning. She spends more time seeing than analyzing. Analytic skills differ modestly from person to person, but perceptual skills vary enormously. Anybody can analyze, but the valuable people can pick out the impermanent but crucial elements of a moment or effectively grasp a context. This sort of perception takes modesty; strong personalities distort the information field around them. This sort of understanding also takes patience. As the Japanese say, don’t just study a topic. Get used to it. Live in it for a while. Because of her limitations, she tries to construct thinking teams. In one study, groups and individuals were given a complicated card game called the Wason selection task. Seventy-five percent of the groups solved it, but only 14 percent of individuals did. She tries not to fall for the seductions that Collins says mark failing organizations: the belief that one magic move will change everything; the faith in perpetual restructuring; the tendency to replace questions with statements at meetings. How many organizational leaders do you know who match this description? I want to see many more of them and that is what my work with New Possibilities Associates is about. How do we change our neighborhoods, communities, nations and world? This story has been told countless times by speakers trying to inspire individual action in the face of monumental tasks. The old man smiled, and said, "I must ask, then, why are you throwing starfish into the ocean?" Upon hearing this, the elderly observer commented, "But, young man, do you not realize that there are miles and miles of beach and there are starfish all along every mile? You can't possibly make a difference!" The young man listened politely. Then he bent down, picked up another starfish, threw it into the back into the ocean past the breaking waves and said, "It made a difference for that one." This has been circulated in many versions, usually with no mention of author. It is said to be paraphrased from "The Star Thrower" by Loren Eiseley, 1907 - 1977. I have always found this story slightly disturbing. I am uncomfortable with the conclusion some people draw for the story that saving one is enough. I always wanted to ask the name of the one that had been helped and go talk to them, but I never did. Here is another version of the Starfish Story where that happens. One summer's day a little girl was walking on a long, winding beach. She came across a starfish that had been washed ashore and was now wriggling and drying up quickly in the hot sun. She reached down, gently picked up the starfish by one of its five points, and tossed it back to the sea. The little girl smiled and continued walking along the beach. But after a few steps, she found another starfish. It too was dying in the sun. No sooner had she tossed this one back when she came across another starfish. And then another one. She tossed each one back. She reached the top of a dune and came to a sudden stop. What she saw below startled and amazed her. Stretching out in front of her were hundreds upon hundreds- possibly thousands upon thousands -of dying starfish washed up on the beach. Suddenly, she exploded into action and to toss as many starfish as possible, one by one, back to the sea. She was so busy tossing back the starfish, that she never noticed that a person had stopped to watch her. Soon a whole crowd had gathered. They were all pointing at the little girl and laughing. "That little girl's crazy," said one. "I know," said another, "doesn't she know that every summer thousands of starfish get washed up on the beach and die? It's just the way things are." "There are so many starfish. She couldn't possibly make a difference." The little girl was still too busy tossing back starfish to notice them. Finally, one man decided he had seen enough. He walked over to the little girl. "Little girl," he said, "there are thousands of starfish washed up on the beach, you can't possibly hope to make a difference. Why don't you give up and go play on the beach with the other children?" The little girl's smile suddenly vanished. She saw the crowd of people for the first time, and realized they had all been laughing at her. Now they had fallen silent, awaiting her answer to the man's question. She was hot. She was tired and close to tears. She began to think that maybe he was right- maybe they were all right. She had been tossing back starfish for what seemed like hours, and a carpet of starfish still covered the beach. How could she have possibly thought she could make a difference? Her arms fell limp at her sides, and the starfish she was holding fell back to the hot sand. She started to walk away. Suddenly she stopped, turned around, reached back down and picked up the starfish she had dropped. She swung back her arm and tossed the starfish as far as she possibly could. When it landed with a plop, she turned to her questioner, and with a huge smile on her face she said: "I made a difference to that one!" Inspired, a little boy emerged from the crowd, picked up a starfish and sent it soaring back to the sea. "And I made a difference to that one!" he said. One by one every member of the crowd joined in sending drying starfish back to the sea, calling "I made a difference to that one" with each toss. Soon the voices began to quiet down, and the little girl wondered if people were getting tired or discouraged. And then she looked across the beach and what she saw startled and amazed her: All the starfish were gone. There—that feels a lot better. We are called to realize that if anything is going to be saved, it will take many of us working together. We can’t save one, we can only save all. And that all of our intentions and actions send out ripples that affect the world in ways we cannot know in advance and may never know. For every complex problem there is always a solution that is clear, simple and wrong. This seems to be more and more true as we face issues and conditions that require an approach different from what know as problem solving. Problem solving has us believe that things can be clearly defined and are discrete in themselves. It also leads us to believe that to solve a problem, all we have to do is look at the issue in the narrowest context and apply a short-term, straight-line fix. Although there are issues and conditions that can be successfully addressed this way, fewer and fewer issues and conditions will respond to this approach—and certainly not the most important ones. Nearly every problem faced by an organization is exceedingly complex. Yet we act as if simple cause and effect is at work. We push to find the one simple reason things have gone wrong. When we consider the truly critical issues of our time such as environmental deterioration, poverty, endemic ill-health, urban blight, social polarization, etc., we find it virtually impossible to view them as problems that exist in isolation --or, as problems capable of being solved in their own terms. Things are much more interconnected and interrelated. Our actions and their results are now widely separated in time and space. The future is unfamiliar and unpredictable. Solutions cannot be calculated in advance based on what has worked in the past. Emergent solutions have to worked out as situations unfold. People involved look at things very differently because of greater diversity and lower trust. Solutions cannot be given by authorities; the people involved must participate in creating and implementing solutions. High complexity demands new ways of solving problems. participants are open to solutions proposed by leaders or experts. The problems we are seeing today are more and more the unintended result of the solutions implemented during the last round of problem solving. A problem cannot be solved at the same level of thinking at which it was created. Committed to finding new solutions to wicked problems. New Possibilities Associates is dedicated to advancing the success of teams that are working together in new ways to improve health and wellness, fight poverty, create sustainable communities and run our organizations well. We support the new leaders who are engaging fresh practices and approaches, shifting cultures and bringing new life to our communities and colleagues.